Do We Really ‘Exchange’ Our Labor for Anything? Guess Again! Every voluntary trade involves giving up one thing for another that seems worth more. A kid trades a baseball card for a Green Hornet power ring. You give me an income; I give you my labor. That means that the Green Hornet power ring and my salary are more important to the kid and to me, respectively, than his baseball card and my labor are to us. Hence, these trades, like every other exchange, happen only because what we have means less to us than what we want to get from the exchange—with the possible exception of the exchange of Xmas and other gifts, which are supposed to be uncontaminated by such quid-pro-quo calculations. True, in all heartfelt exchanges of gifts, in the end one thing has been exchanged for another, but only as a consequence, not as an objective—a kind of momentary triumph of intimate, personal, caring, concrete people-oriented “Gemeinschaft” over commercial, impersonal, abstract, cost-benefit, profit-oriented “Gesellschaft”. The beauty of pure gift exchanges is that they offer a respite from transparent cost-benefit, “what’s-in-it-for-me” thinking, motivation, perceptions and feelings. Admittedly, like their more self-centered counterparts, gift exchanges result in a transfer of goods or services that, when agreed upon, leave both parties feeling and materially better off. But unlike barter and other commercial exchanges, the exchange of gifts creates gratitude, instead of smug satisfaction in having pulled off a profitable deal—yes, “profitable”, since a completely “rational exchange” is one characterized by a net gain for both parties, much as a valid contract always provides each party with “consideration”, i.e., some benefit, in addition to other conditions, essential to making the contract valid and binding. Clearly, the exchanges that our jobs represent are neither like Xmas gifts nor extortion: We freely exchange our labor in return for an income, goods, services or promises—or so it seems. But, is it possible that this exchange model does not really capture what happens when we accept a job, that, somehow, exchanging one’s labor is very different from exchanging one’s baseball card for a Green Hornet ring? For the model to apply, both the employer and the employee would have to be giving up something of positive, but less perceived comparative value for something of perceived greater value. However, because expending energy in the form of labor is something at least some of us at least occasionally resist, if not loathe, in what sense can we be said to be exchanging something of intrinsic or other value for something of greater value? To see the apparent conceptual problem here, imagine the pre-exchange situation: I have labor—actually, potential labor in the form of as yet unexpended effort—available for exchange. Although the fruits of that labor, namely, whatever I create, transform or otherwise produce with it, have value—i.e., “utility” to both an employer and me, the labor per se, as expended effort, can be quite unpleasant, e.g., tiring, boring, irritating or a huge opportunity cost at the expense of poolside tanning. This is a very different “exchange commodity”, quite unlike a baseball card, because, unlike the case with ownership of a baseball card, I have no prior or previous incentive to keep or benefit from “owning” my labor, inasmuch as owning my labor can be like owning my own cold, headache or toothache, if “labor” designates “unpleasant effort for the purpose of gaining some utility”. 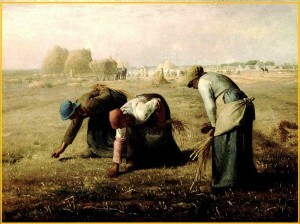 Sure, some labor is pleasant—e.g., the much-vaunted “labor of love”, such as the efforts of a dedicated social worker. But much, if not most, of it on a job that is “just a job” is expended with some reluctance or at least not as a first-choice, preferred effort, e.g., a brisk swim on a hot day. As for “labor of love” as a traded resource, in virtue of being pleasant, it is the only form of labor that behaves like other valued commodities when exchanged–namely, something positively valued given up in exchange for something nonetheless valued more. Ah, so unpleasant labor is like backyard junk: unappealing to me and in fact an irritant or nuisance, but to the weird “art” collector who wants to buy it all, precious? When I exchange backyard junk for money, not only is the money worth more to me than the junk, but also the handover is immensely satisfying—which is not something we can say about the handover of our labor. When I have to supply onerous or otherwise unpleasant labor to get the money in exchange, I do so under a kind of duress or with some reluctance, if I’m at all “lazy” or otherwise disengaged, and therefore expending effort is something I’d rather not do, if I can avoid it. Hence the equation “my labor=my backyard junk” is incorrect, even as an analogy, because I would be eager to get rid of, maybe even just give away that junk, but never feel that way about my labor, which amounts to unpleasant effort. Of course, others will want my labor for their purposes; but when I “exchange” my labor with them for something in return, I am neither reluctantly giving up something of great value to me for something I want or need, nor gladly giving up something worthless to me for free or for net gain, nor comfortably or shrewdly giving up something I can replace at a “profit” or at no cost. I may, in the first case, indeed be giving up my labor reluctantly—but not because expending effort in the form of labor is of positive value to me independently of the exchange. No, it isn’t, not at all. The only value that unpleasant labor has is its exchange value—being utterly devoid of prior, non-exchange utility, unlike a cherished baseball card or Green Hornet power ring or family photo. In the second case, although I am giving up something inherently worthless to me apart from its exchange value, I am not doing so gladly, as I would in handing over my backyard junk—because “handing over” onerous labor means performing it. As for the third case—acceptable replacement cost or net profit, the last thing I would ever want to do if I don’t like expending effort in ways that aren’t fun would be to “replace” that labor, i.e., expend more effort as replacement for the effort I expended. Notice how clearly labor differs from a baseball card or money: These, unlike performed labor, we are happy to replace when they’ve been sacrificed for some purpose, if the replacement cost and benefit mix is acceptable or better. The key point in all of this is that although labor has exchange value, since it is something we give to get, it is a unique exchange commodity—so distinctive and weird that to compare it with other things we exchange, such as baseball cards or money-for-something would be to fail to understand it. We often hate having it, e.g., as an hour of unpleasant expended effort, as much as giving it up; the only way to “get rid of it”—whether for gain or not—is to make sure it never comes into existence, that it exists only a potential resource to be traded; and that the last thing we ever want to do is replace it. To see how strange this is and how it makes a muddle of the concept of exchanging our labor for income or anything else, re-read the immediately preceding paragraph and replace the concept of “labor” with the concept of “money”—which, like unpleasant labor has no justification for existing other than to facilitate exchange or creation of some utility. “Hate having it?”—money? Hardly. The only way to get rid of it is to make sure it never comes into existence? No way. The last thing we want to do is to replace it? You’ve got to be kidding! Exchanging the concept of “labor” for that of “money” in this way and exploring the implications not only demonstrates the strangeness of the notion of labor as an exchange commodity. It’s also more fun than exchanging labor itself for anything.